America's pediatricians, who cannot explain to American parents why so many of their young, highly vaccinated children are developing autism and other developmental disabilities, announced this week at a conference in San Francisco that it is time for doctors to get serious about diagnosing autism early and often. This push for "early diagnosis" before age two is coupled with a push for "early intervention." Currently that intervention involves doctors prescribing psychiatric drugs for 80 percent of the children diagnosed with autism or Asperger disorder according to a report released at the same conference. Although few parents would argue that it is important to recognize when a child is regressing physically, mentally and emotionally into autism, many parents are more interested in addressing the biological root causes for the kinds of brain and immune system dysfunction that their autistic children are exhibiting, rather than giving their children psychotropic drugs that only suppress the symptoms. Many parents, like Cindy Goldenberg in the early 1990's and Jenny McCarthy a decade later, have found that eliminating gluten and casein from their child's diet and employing other alternative therapies to repair healthy immune function, can effectively address vaccine-related biological causes for autism and greatly improve their children's health. However, currently mainstream American pediatricians are overwhelmingly attempting to deal with the autism explosion by drugging children. Tobias Gerhard, PhD, assistant professor at the Rutgers University Institute for Health, Health Care Policy, and Aging Research acknowledged that the prevalence of Autism Spectrum Disorders increased 10-fold in the last decade and presented an analysis of medical care surveys reflecting two million health visits involving autism or Asperger disorder. He found that children were overwhelmingly male and white and that disruptive behavioral disorders were involved with 3 of every 10 cases. The surveys revealed that about 80% of children diagnosed with Autism Spectrum Disorder are treated with at least one psychiatic drug; 30% are given antipsychotic drugs, 40% antidepressants, 40% stimulants and about 30% some other drug, including mood stabilizers and anticonvulsants. Some children are prescribed several medications. "As with many psychiatric conditions in children, we really know very little [about] how these drugs actually work and how they should be used in practice," Dr. Gerhard said. In Canada, where there is a nationalized health care system and long waiting lines for a doctor's appointment, there is a warning by Canadian pediatricians that early screening and treatment for autism is easier said than done. The former president of the Canadian Pediatric Society, Emmet Francoeur, points out that increased screening would involve an increase in the number of evaluation teams and treatment services, all of which is time consuming and expensive. He says "Unfortunately, unlike a broken bone or pneumonia, where you can take an x-ray and come up with a diagnosis, it takes multiple observers looking at multiple aspects of a child's development to diagnose autism." As hard as it is for pediatricians to figure out how they are going to identify and treat lots of highly vaccinated autistic children, it is much harder for parents searching for answers for why their once healthy children developed autism and how to help them heal. The diagnostic screening tests, the visits to different doctors specializing in different parts of the body and the drug and behavioral therapies that may or may not work, can bankrupt the average middle class family. One day, the educational and health care costs associated with the biggest epidemic our nation has ever experienced - the chronic disease and disability epidemic - may bankrupt our nation. It is a chronic illness epidemic that makes the polio epidemic of the 1950's look small by comparison. We are all paying a very high price for the failure of pediatricians, drug companies and government health officials to act responsibly in the 1980's when parents of DPT vaccine injured children pleaded with them to conduct methodologically sound scientific studies to investigate the biological mechanisms and genetic factors involved in vaccine-induced regression and neuroimmune dysfunction. 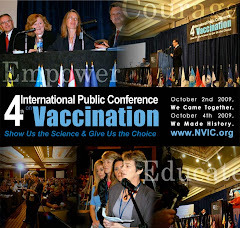 On Friday, Oct. 19, 2007 NBC's "Today Show" featured a 6 minute segment about the rising numbers of parents who are taking exemptions to vaccination for their children. In the live debate, which was moderated by "Today Show" co-host, Meredith Vieira, I faced off with California pediatrician Tanya Remer Altmann, M.D. "I have been a vaccine safety activist for 25 years and I have never seen the public debate about the right of parents to make informed, voluntary vaccination decisions be more intense than it is today. And I think that is because the states are requiring twice as many vaccines as were required in the 1980's and 90's when my children - my three children - were getting vaccinated. And, we are seeing with this increased vaccination 1 in 6 child now learning disabled, 1 in 9 asthmatic, 1 in 150 becoming autistic. We are seeing a child public health crisis that is unlike any crisis we have ever seen, including the epidemics of infectious disease we have experienced in the past." Today, California autism activist Rick Rollens has released another new report on the skyrocking autism cases among young children living in California, all of whom got twice as many vaccines as my children got when they were young. Rick's son developed autism after suffering vaccine reactions and Rick went on to co- found the M.I.N.D. Institute - UC Davis after first warning America about the autism epidemic in 1997. His work with the California legislature to address the autism epidemic has included issuing periodic reports since 1997 about the never-ending increases in the numbers of children developing autism in California. Rick reports that a record 1,060 new intakes of professionally diagnosed full syndrome DSM IV autism were added to California's developmental services system from July 3, 2007 to October 3, 2007. Children eligible for DDS services are between 3 and 21 years old. Three year old children entering the system today would have been born in 2004. "According to the most recent report released this past week by California's Department of Developmental Services (DDS) (www.dds.ca.gov), California's developmental services system added a record 1,060 new intakes of professionally diagnosed full syndrome DSM IV autism during the 87 day period from July 3, 2007 to October 3, 2007....a rate of 12 new children a day, seven days a week..... or one new child every two hours. Never in the 40 year history of California's developmental services system have 1000 or more new children been added in any one three month period to it's system. During the past 9 months alone California has added over 2900 new children with full syndrome autism (as always, the numbers of new intakes ONLY includes professionally diagnosed cases of full syndrome DSM IV autism and DOES NOT include any other autism spectrum disorders like PDD, NOS, or Asperger's Syndrome). Keep in mind that it took 16 years (from 1971 to 1987) for California's DD system to see a total population of 2700 persons with autism...during the past 9 MONTHS alone California has added 2900 new cases. Autism is not only the fastest growing condition in California's DD system, now accounting for over 60% of all the new intakes (the remaining less then 40% being the COMBINED numbers of new intakes with mental retardation, cerebral palsy, epilepsy, and conditions that have as part of the condition mental retardation such as genetic diseases Fragile X and Down's), but; now there are more persons in California's DD system with a primary diagnosis of autism than with cerebral palsy. Unlike any other of the conditions served by California's DD system where you see between 55- 60% of those populations over the age of 22 years old, with autism only 16% of the population is over the age of 22 years old, 84% between 3 and 21, and eight out of ten between 3 and 18 years old." While educated Americans challenge the scientific and moral basis for legally requiring citizens to use multiple vaccines throughout life, forced vaccination proponents like rotavirus vaccine patent holder and Merck consultant, Paul Offit, M.D., are leading an unprecedented assault on the philosophical and religious belief exemption to vaccination. Dismissing parental concern about vaccine risks as an "irrational, fear based decision," he and his colleagues want to socially ostracize and legally punish those who approach maintaining health and wellness in a different way and decline to purchase and use every vaccine industry produces and government recommends. 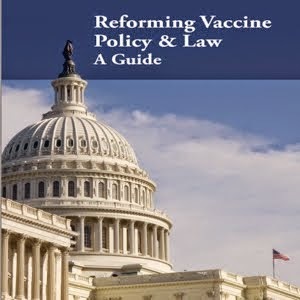 (http://www.ncbi.nlm.nih.gov/sites/entrez?cmd=retrieve&db=pubmed&list_uids=12037257&dopt=AbstractPlus), as well as lawyers, vaccine manufacturers and CDC officials. At the symposium, discussions involved (1) requiring vaccination of all nurses and other health care workers as a condition of employment; (2) passing laws to facilitate prosecution of parents of unvaccinated children for economic damages when vaccinated children contract vaccine preventable diseases; (3) routine posting and publishing of lists of unvaccinated individuals in public places in communities; and (4) prosecuting parents who homeschool their children for child neglect if they do not vaccinate them. In the majority opinion, the Justices demonstrated a remarkable blind faith, bordering on religious conviction, in the infallibility of medical doctors and the safety of smallpox vaccination. The Court stated that "The matured opinions of medical men everywhere and the experience of mankind as all must know, negative the suggestion that it is not possible in any case to determine whether vaccination is safe." Only briefly did the Justices address the issue of individual susceptibility to the potentially harmful effects of vaccination when they stated that mandatory vaccination must not be forced on a person whose physical condition would make vaccination "cruel and inhuman to the last degree. We are not to be understood as holding that the statute was intended to be applied in such a case or, if it was so intended, that the judiciary would not be competent to interfere and protect the health and life of the individual concerned. All laws should receive sensible construction." Of course, in the succeeding 100 years since that Supreme Court decision affirming the power of the state to "keep in view the welfare, comfort and safety of the many and not permit the interests of the many to be subordinated to the wishes or convenience of the few," it has become clear that doctors cannot determine ahead of time who will be harmed by vaccination and that many more than a "few" have been injured or died from the effects of mass use of multiple vaccines in childhood as evidenced by the nearly two billion dollars paid to vaccine victims by the government since 1988. An interesting historical fact about the fallout of the ethically flawed Jacobsen v Massachusetts decision is its citing by US Supreme Court justice Oliver Wendall Holmes in 1927 to justify the eugenics- movement inspired forced sterilization of a mentally retarded girl. Holmes agreed that the state could compel the young girl to be sterilized because "the principle that sustains compulsory vaccination is broad enough to cover cutting the fallopian tubes." Since 1905, the numbers of vaccines recommended by doctors and required by state law has increased from one vaccine - smallpox - to nearly three dozen doses of 10 to 12 vaccines. Do you know what your pediatrician is asking your child when you step out of the examining room? I'll bet you'd never guess. According to one Dad in Massachusetts, the American Academy of Pediatrics (AAP) have convinced America's pediatricians that they are agents of the State rather than healers paid by parents to offer medical advice for their children. He reports that the AAP now encourages doctors to ignore "legal barriers and deference to parental involvement" and spy on families by extracting personal information out of their little patients about Mom and Dad's lifestyle choices. Whether pediatricians are just behaving badly in Massachusetts or are acting out all over the USA, it is disconcerting to hear that any doctor is secretly grilling children about whether Mom and Dad make them feel "uncomfortable" or smoke, drink, get high on (prescription?) drugs or own a gun. Even more alarming is the allegation that some pediatricians feel compelled to make a "report" to the State when the trusting little souls snitch on Mom and Dad for having a Michelob while watching Monday night football or harboring a registered rifle for duck hunting. What makes this story so compelling is that a lot of doctors are acting like policemen these days. Could it have anything to do with the fact that, during the past quarter century, America's private docs have become joined at the hip with the ones wearing white military uniforms, who are running the U.S. Public Health Service? Vaccination has been used as an organizing tool by over-zealous public health officials to appropriate power during the past quarter century. And their zeal has gotten a whole lot worse since September 11, 2001. Apparently "public health" advisors to the U.S. House Homeland Security Committee either consider visiting North Carolina and Alabama to be Third World hazardous duty or they think NASCAR fans are especially infectious. Either way, somebody had to think real hard about which vaccines to put on the congressional staffer's "must do" list before heading for the race track. Most of the vaccines selected were either in the "poor sanitation" (tetanus, diphtheria, hepatitis A) or risky "lifestyle" (hepatitis B) category. The militarization of America's medical profession is a prescription for civil rights disaster. The next time you witness a doctor acting like a CIA operative or policeman, stifle the urge to either salute smartly or cower in the corner. Instead, publicize his or her bad behavior by writing an Op Ed in your local newspaper. And don't forget to blast it into cyberspace, where truth and freedom are alive and well. It has been a bad year for drug company lobbyists and doctors pressuring politicians in California to pass new vaccine mandates for children in the state. GARDASIL maker, Merck, and pro-forced vaccination proponents tried to ram through HPV vaccine mandates last winter and, when they were soundly defeated, tried to pass a law (AB16) this summer that would have allowed a State Health Officer to mandate every new vaccine the CDC recommends for universal use. That proposed law did not make it to the Governor's desk but a bill to mandate Prevnar (pneumococcal vaccine) did get to Governor Arnold Schwarzenegger's desk (SB 533) and he vetoed it on October 5. "I am returning Senate Bill 533 without my signature. While I am a strong proponent of prevention and support efforts to improve vaccine rates for children, I am unable to sign this bill as California's public health experts believe it is not needed. The Department of Public Health can already require young children receive the pneumococcal vaccine. California's vaccine experts have not established a mandate because they believe it is not needed. Approximately 86 percent of children are already being vaccinated under a voluntary system. For this reason, I am returning this bill without my signature." Behind the scenes, federal and state public health officials have always joined with the American Academy of Pediatrics (AAP) and other medical organizations to support the lobbying efforts of vaccine manufacturers to get new vaccines mandated by states. This successful lobbying blitz has resulted in the more than doubling of the numbers of doses of vaccines children must get in order to attend daycare or school in the past quarter century. Vaccine mandates mean assured and predictable profits for vaccine manufacturers. However, the fact that Governor Schwarzenegger indicated in his veto statement that state public health officials did not believe they needed the Prevnar mandate because "86 percent of children are already being vaccinated under a voluntary system" is an encouraging sign. Perhaps California state health officials are beginning to pay attention to the public's growing distaste for new vaccine mandates and have decided to pick their vaccine mandate battles more carefully. The same is true for Merck's GARDASIL vaccine. Merck's financial bottomline has been helped enormously by voluntary use of GARSASIL by women and young girls in America since GARDASIL was licensed in 2006. Vaccines should be subjected to the law of supply and demand in the free market system like any other product produced by any industry. When people are allowed to exercise informed consent to risk taking, they own the decision they make and can take responsibility for the consequences of that decision. When people are forced to take a risk rather than make a voluntary, informed choice, they justifiably feel betrayed by those who coerced them when the risk turns out to be 100 percent. Governor Schwarzenegger has the right idea: vaccine mandates are not needed for every vaccine that industry produces and the federal government promotes for children. In yet another stunning example of arrogant and immoral behavior, doctors at the World Health Organization (WHO) and Centers for Disease Control (CDC) admitted last week that they deliberately did not tell "the public" that neurovirulent mutated vaccine strain live polio viruses are polluting world water supplies and are responsible for polio outbreaks among children in Nigeria and other countries. Dr. David Heymann, a leader in WHO's polio eradication effort, reportedly explained that WHO "considered the [Nigerian] outbreak to be a problem for scientists and not something that would change global vaccination practices" so WHO didn't share the information with the public until now. but also has created mutant paralytic viruses that could cripple many more humans than would have been crippled if the live virus polio vaccine had never been used at all. The US abandoned the Sabin live polio vaccine in 1999 and switched to the inactivated Salk vaccine that cannot cause vaccine strain polio. So why are billions of dollars being spent to pour the risky live virus polio vaccine into the mouths of the poorest babies in the most underprivileged countries in the world where sanitation and water supplies are already compromised? http://vaccineawakening.blogspot.com/search?q=India%2C+polio+vaccine Although public health officials are trying to blame polio outbreaks on the 'unvaccinated," the medical literature documents that assertion to be false. 1) In 1999, Paul Fine took information from a WHO document and published an article in the American Journal of Epidemiology on the transmissability and persistence of oral polio viruses. He concluded that "the findings indicate that OPV viruses could persist under various plausible circumstances" after mass vaccination with live OPV around the world is stopped. For too long, vaccine-wielding doctors employed by the U.S. government and worldwide medical organizations, like the WHO, have joined with pharmaceutical companies and conned politicians and populations around the world into accepting forced use of vaccines that have not been properly tested and regulated. When doctors and scientists think they are entitled to experiment on people and keep those medical experiments secret, it is no wonder that iatragenic diseases like cancers, AIDS and mutated vaccine strain viral diseases soon follow. It is time to take the holy robes off of doctors and scientists who are tinkering with the biological integrity of the human race and the ecological balance on earth. The parents in Africa and India, who are fleeing from the vaccine-wielding doctors hunting their children down, are not ignorant or crazy. They are exercising common sense. FOR 25 YEARS, THE NATIONAL VACCINE INFORMATION CENTER HAS BEEN TELLING THE TRUTH ABOUT VACCINE RISKS AND FIGHTING FOR YOUR FREEDOM TO MAKE INFORMED, VOLUNTARY VACCINATION CHOICES. PLEASE TAKE A MOMENT TO CONSIDER HOW IMPORTANT THIS VOICE FOR TRUTH AND FREEDOM IS FOR YOU, YOUR FAMILY AND FUTURE GENERATIONS. A study funded by British vaccine maker, GlaxoSmithKline, and conducted by University of Rochester vaccine developers claims to have proven that simultaneously injecting infants with 7 vaccines in separate shots is no more reactive or less effective than simultaneously injecting infants with 7 vaccines contained in combination shots. Specifically, GSK conducted the study in an effort to "prove" that the 5 vaccines in 1 shot, Pediarix, can be given simultaneously with other vaccines without causing more reactions or compromising the effectiveness of the pertussis (whooping cough) portion of the shot as pre-licensure studies indicated. What do GSK officials and University of Rochester doctors running the study for GSK think that they have proven about Pediarix safety and effectiveness? Do they really believe the educated public will be reassured by a study that only included 575 two month old healthy babies divided into three groups - all of whom got seven vaccines whether given separately or in combination? To accurately answer outstanding questions about Pediarix safety and effectiveness - as well as the safety and effectiveness of repeatedly injecting babies with seven vaccines simultaneously at two, four, and six months - GSK would have had to prospectively enroll at least 3,000 - 5,000 infants aged two months to five years and followed them up for at least five years. The study should also have included an unvaccinated group of children with a five year follow-up period to compare the brain and immune system function of unvaccinated children to those who were injected with Pediatrix in combination with other vaccines. By age five, the symptoms of ADHD, learning disabilities, autism, asthma, severe allergies and other neuroimmune dysfunction become apparent and, if autism occurs in about 10 per 1,000 children, a study of 3,000 to 5,000 children would yield between 30 and 50 autistic children by age five in all groups if there are no health outcome differences between vaccinated and unvaccinated children. Even without an unvaccinated control group, it is ludicrous to conclude that studying 575 healthy newborns and following them up for 7 months generates enough useful data to conclude much of anything about giving infants so many vaccines on one day, whether the vaccines are given separately or in combination. This study by GSK to promote purchase and use of Pediarix does nothing to reassure parents and doctors that there are no adverse long term health consequences from repeatedly using this vaccine in combination with other pediatric vaccines in the first year of life.